I believe that’s happening with River Song 5, as, having crossed paths with the Doctors, its time for River to meet the Masters. Including Eric Roberts and Michelle Gomez for the first time on Big Finish. It doesn’t have to be. I am hoping that Chibnall has less fascination with her than Moffatt. I thnk that Moffat pretty much closed River’s circle, but since she’s a time traveler she can still show up. A nice obituary for production designer Michael Pickwoad (who, among other things, designed the show’s latest TARDIS interior), including some warm comments from Moffat. “The first time I met Michael Pickwoad properly, I laughed, and you probably would have too. We were both heading to Michael’s first Doctor Who tone meeting, and he’d arrived wearing a tweed jacket and a bow tie. “In costume, I see!” I said. He gave me a bemused smile (I’d get very used to that smile) and we went into a dull white room and discussed flying sharks and cryo-pods for the Doctor Who Christmas special. Some time during the meeting, it occurred to me that Michael hadn’t understood why I’d laughed, and the more I listened to him talking the clearer it became that he wasn’t in costume at all: I was dealing with a designer who dressed exactly like Doctor Who by accident. Clearly, this man was born for this show. I’ve never been more right. I see that season 19 is getting a blueray release. Seeing as it looked bobbins on my CRT years ago, what’s it going to look like on blueray, will the BBC-B graphics look totes cool and retro? I didn’t get the previous Blu-Ray release so I’m not sure how good that looked, but I think there’s a limit as to how good these old shows that were mostly shot on videotape can ever look on Blu-Ray. I’m probably going to buy the Red Dwarf set that’s out in a few weeks, so it’ll be interesting to see how that fares. And I’m sure there are plans to do H2G2, too. There’s obviously a demographic for the type of shows they think people are going to be willing to rebuy on Blu-Ray! Yeah, you’re limited by the original elements. A forty year old videotape isn’t going to have the same clarity on blu-ray as something filmed with HD cameras. Standard definition DVD is 480i, and Dr. Who was filmed on 16mm (exteriors) and videotape (studio interios), and then mastered on PAL videotape. PAL has slightly better resolution than SD DVD at 625 lines of resolution, so presenting the material on 1080p blu-ray would present a marginal upgrade in picture quality. I do wonder if they couldn’t have presented the blu-rays at 720p to save space nd have fewer discs in the sets. There was a lot of loss and dropout in the old days of film-to-tape transfer, the only good thing about tape-to-digital is the ability to do digital repairs after transferring. Apparently the rights holders to the bku-ray format are opposed to the idea of people piling lots of lower definition episodes on to fewer discs, as they want it to be seen as the format of high quality video. But, and I say this without having first hand experience with the new blu-ray set, there are gains to be had with blu-ray over DVD even for archival material like this. You get fewer compression artifacts by not having to use the mpg-2 encoded format used by DVD. There’s less compression of audio too. And you can fix the aspect ratio so you don’t have people watching it in widescreen because of poorly set-up players and TVs. Yeah, I’ve heard that the BDA requires that content on blu-ray discs be high definition. A blu-ray disc can hold 50GB, so you could fit five or six DVDs worth of SD material onto one blu-ray disc in 480i, which is what the BDA doesn’t want done. I can see their point; it would be easy for companies to pack a bunch of SD DVD transfers onto a blu-ray disc and pass it off HD, but it would be nice to be able to have full seasons of old tv SD series on a single disc. Or complete tv series in a single case. 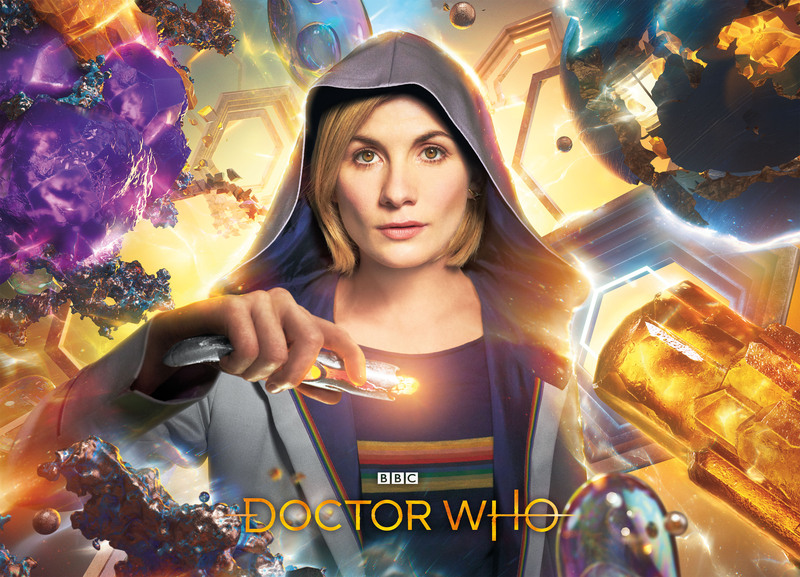 I think, though, that the only requirement is that the feature content has to be presented in HD, so you could in theory take an VHS tape, upconvert it to 1080p, and still release it as a blu-ray disc – which is sort of what they’re doing with Doctor Who here. 720p is still high definition, though I don’t know of any blu-rays that are native in that resolution. It’s not unusual for some supplemental features, especially legacy ones from DVDs, to be in 480p on blu-ray discs, however. The Cushing Who movies were on this weekend. They are quite horrible. Is it just me, or does anyone else want Cushing to drop the act and drive a stake through a Dalek? I have a total soft spot for the Dalek Invasion of Earth - though the antics around pretending to be a roboman always make me cringe. I’ve never seen the other one. I always liked the films, but it’s years since I’ve seen them. The Doctor Who Twitter account just revealed the new series air date in the UK. I can’t remember the show ever being on a Sunday before but it’s not necessarily a downgrade, a lot of shows get high ratings on Sundays as far as I remember. It may also prevent the rescheduling of times when it clashes with the shiny floor shows. Sounds like the BBC is being pretty heavy-handed about spoilers and leaks at this point. This story relates to an itunes listing that briefly suggested that the first episode of the new series would air on Sunday 7 October, as has now been officially confirmed. I’m half-expecting their obsession with secrecy to extend to cutting the visuals and the sound on BBC One for an entire hour while the show goes out, to make sure no-one gets a glimpse of it.